A pioneering social enterprise is poised to launch in a remote part of Africa – thanks to an inspiring student at the University of East London. Michelle Gibb, a mature student at UEL, has partnered with Off-Grid Europe, a leading renewable energy company, to start ‘Sunshine Academy’ – a scheme to provide a Gambian village with solar panels and training to build solar-powered mobile phone chargers and lamps. “I want them to be micro-entrepreneurs,” said Michelle. “What makes this project different is that we want to give villagers the means to make their own solar-powered technology. Michelle’s achievement in setting up the project is all the more remarkable given the tough challenges she has faced in her own life – including being homeless and out of work. 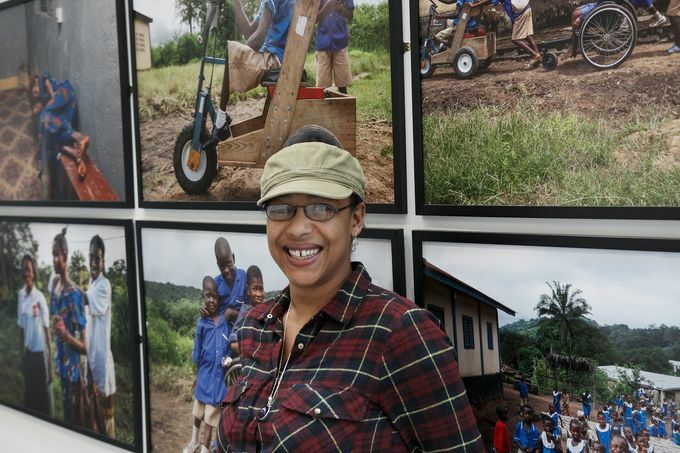 Without a roof over her head, Michelle decided to defer her second year at UEL and travel to Mamuda, a village in The Gambia, to work on various community development projects. While she was there she came up with the idea for Sunshine Academy after witnessing the difficulties villagers faced with simple tasks such as charging their mobile phones. “I saw people having to walk up to 4km to charge their phone, leaving it overnight, and then walking back to collect it the next day,” she said. Spurred on by her dream of giving the villagers a better life, she opted to return to UEL to finish her education. She is currently in her third year at the University, where is studying for a degree in Sociology (Professional Development) – and working hard to turn her Sunshine Academy into reality. And after researching other social enterprise projects, she has now secured the backing of Off-Grid Europe to provide solar panel off-cuts from their manufacturing process. Off-Grid Europe consultant Mark Kragh said he was impressed with Michelle’s ambition and was keen to support her project. Michelle has also won the support of local Newham councillor Aleen Alarice, who has agreed to become a Sunshine Academy patron. “I was inspired by Michelle’s story, and think Sunshine Academy has great potential for the people of The Gambia,” said Councillor Alarice. Michelle is now in the process of raising the funds to put her plans into action, and is on the look-out for companies or individuals to lend their financial support. She added that the villagers in Mamuda were excited about the prospect of making their own solar-powered energy. “I did a survey with 56 villagers and the feedback was really positive,” she said. “The village chief is behind it and even allocated a piece of land so we can build a skills centre. As someone who faced homelessness, Michelle says the UK could also learn something from life in The Gambia.